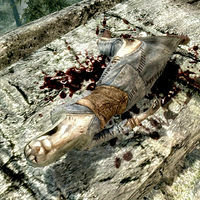 Khajiit are unnamed and deceased Khajiit scattered around Skyrim. These Khajiit are all female citizens and wear randomly determined farm clothes (7 variations) or a belted tunic, a pair of boots (4 variations), with a 50% chance for a hat (3 variations). Additionally, there is a slim chance they may carry a lockpick and a small amount of gold. Two can be found in the caves underneath Pinewatch, in the western part of the first huge chamber; one lies on the huge grate, while the other one lies on the spikes beneath. One in Fort Greenwall, amidst a pile of rubble on the ground level (only appears if bandits inhabit the fort). One inside Bloodlet Throne, in a cage near the arcane enchanter. She is often reanimated by the vampires. One in the depths of Fellglow Keep Dungeon, hanging in a cage in the chamber west of the imprisoned wolves. One lying on a chest a few feet north of the Boulderfall Cave entrance. The patrolling necromancer will often reanimate her. One is at the top of Falkreath Watchtower. She is often reanimated by the residing necromancer. Three near two broken carts on the road east of Helgen (will be permanently disabled during Before the Storm - see this section). These Khajiit are all male citizens and wear randomly determined farm clothes (7 variations) or a belted tunic, a pair of boots (4 variations), with a 50% chance for a hat (3 variations). Additionally, there is a slim chance they may carry a lockpick and a small amount of gold. One in the northeastern chamber of Bleakcoast Cave. One lying in a pool of blood in the center of Steamcrag Camp. One just outside Broken Helm Hollow, at the base of the waterfall. 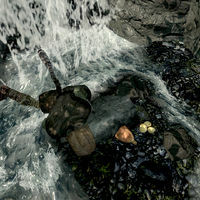 One fell off the cliff outside Brood Cavern. Two near two broken carts on the road east of Helgen (will be permanently disabled during Before the Storm - see this section). These Khajiit are all male citizens and wear iron armor with hide boots and bracers. They carry a leveled weapon (6 variants, all of them up to elven quality at level 22) and have a slim chance of carrying a lockpick and a bit of gold. 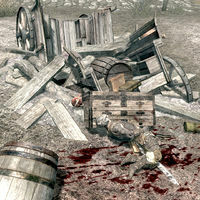 One in Steamcrag Camp, near a broken wagon and a dead horse. This Khajiit is a male citizen. He lies dead on a table in the Fellglow Keep Dungeons and wears ragged trousers. Additionally, there is a slim chance he may carry a lockpick and a small amount of gold. You may randomly encounter an unnamed Khajiit wandering the roads of Skyrim. He will offer to sell you some skooma and may become hostile depending on your answer. 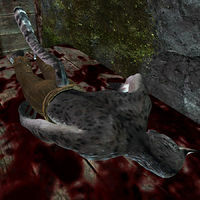 For more details, see the Skooma Dealer page.